My family and I began to experience a time of turbulence last March when I learned that my contract at the National Museum of Ireland wasn’t going to be renewed. On paper, it shouldn’t have come as a shock – five years ago I signed a contract that said I was being employed on a fixed-term basis, for five years. But in total I’d been there for almost eight years, working on the same project, and I’d been convinced for various reasons that the position should never have been for just five years and that it would be saved. But it wasn’t and I got my perfunctory “thank you for your service” letter in the post to confirm. That evening I sat on the stairs and cried my eyes out. At that point it wasn’t for the fear of unemployment, or worry about the mortgage, or even how we were going to feed and clothe kids (I was the breadwinner then). It was the awful feeling of loss. My poor little babies howled back at me from the other side of the sitting room door, wondering what on earth was happening to me, until my partner had to let them out to me on the stairs. I cuddled them in my lap and tried to react coherently to the confusion. My four-year-old asked if I was sad that I didn’t have a meeting, and tried to reassure me she and me could have a meeting instead. Talking to my sister later about it, I said that the confirmation of the job loss felt almost like grief. She pointed it that it was indeed a little bereavement. This was the emotional side of redundancy, as outlined on the Surviving Redundancy website. I was losing part of me that for nearly eight years had got copious levels of my passion, energy, knowledge, belief and care bestowed in it. I had loved my work. It’s not that it hadn’t been beset with challenges. It kept me away from my kids when they came along. There were days where I felt overwhelmed at the enormity of the project. And there were days where time-honoured systems meant I felt like I was in that scene in Alice in Wonderland (the 1951 movie) where everyone tries to dry off after the flood of Alice’s tears by cheerfully running in a circle in the tide wash.
That is to say, it was often infuriatingly frustrating. The job was arguably a worthwhile one, and its purpose hasn’t gone away. Justine McCarthy even mentioned it in her Sunday Times article Barbarians at gate must guard our ivory towers on 3rd of June 2012. I know there is great spirit to revitalise pursuit of the project’s objectives. Meanwhile my job is a casualty of the financial crisis, a convenient discardment by the state in a national endeavour to cut costs. There I am, doing my patriotic bit. My Dad had the book left open on the book shelf at that page one of the weekends I was home in the initial days of my discombobulation. [I should also point out here that one of the lowest points of my situation was the regression to child-like state while my parents anguished for my future all over again.] I spotted it and slammed the book shut, muttering something about it not applying to my situation – my job was not redundant: a faceless they just wouldn’t let me do it anymore. My partner gently tried to point out to me, that if there was no more funding to pay me to do the job, then the job was indeed redundant. At the same time, perversely maybe, the matter was compounded by a need to wind things down on the job. In the finish it became impossible to do that satisfactorily, due to the nature of the project’s challenges and the relatively short notice regarding my contract’s demise. I had to let our volunteer team go, which was pretty miserable. Add to it all the sickness I went down with in my last week, caused in no doubt by a depressed immune system tanked up with stress. I got tonsilitis and impetigo. I’m not even prone to tonsilitis. It was rotten. The impetigo was worse. It made my toenail fall of! I muddled through, struggling and morose and distracted and for a time a shadow of anything useful to my family. And then, relentlessly, redundancy was upon me. Then it was really time to worry about the mortgage, or even how we were going to feed and clothe kids. My staff badge expired and I was ejected fearfully into the unknown. The day in May that I walked into the Navan Road social welfare office I felt nervous and sad, but purposeful. The porter at the reception desk was helpful, and positively bubbly, and I felt encouraged. They renamed the dole jobseekers benefit recently, and I focussed on that to remind myself that there should be no stigma associated with receiving it, that I should feel no shame in receiving what is my entitlement, my own money pooled as PRSI for this very eventuality while I was still working. But then I sat at a service desk windowed with thick Perspex, for fear I’d assault the staff, the cubicle etched with unkind grafittied messages. The unsmiling office clerks seemed to interrupt me to ask for my PPS number anytime I tried to speak. The civil servant who dealt with my claim did seem to try to soften her chirrupy manner when she noticed me blinking profusely to keep back tears. Archaeologist she said! What an interesting job that must be. And the Museum? That must be a lovely place to work. I found the social welfare aspect of redundancy decidedly contemptuous, even though I was claiming money that I felt was rightfully mine. I don’t think it needs to be that way. But I knew I needed to get away from it. Slowly but surely I tried to be more philosophical and proactive about things. By now my toenail sacrificed to stress-impetigo is starting to grow back. Along with my ability to get on with things. that acceptance finally began to set in. Why is it that “reality” in these situations is always associated with starkness or difficulty? The real world is always the “harsh” or at the very least, the “uncertain” world”. Reality bites. Things just got real. It wasn’t as if I wasn’t aware of my priorities – but I think I just needed someone who wasn’t emotionally involved to help me see them in a detached, objective kind of way. The maelstrom began to slow down. I began to find hooks to grasp. I made a resolutions chart, a la Gretchen Rubin‘s “The Happiness Project” which I started to read around the time my contract was finishing. It might seem random but it gave me focus. You’ll see that writing a blog is one of the resolutions. With this post, I consider it launched. TICK! I withdrew from my PhD at UCD, which was intrinsic to the paid job and sponsored mainly by work. That was a very hard decision to face and I procrastinated about having to send back my student card, but it’s done now. UCD’s School of Archaeology were among those who were incredibly supportive and kind in the confusion. Together with my partner, I somehow managed to make the decision to enrol my daughter in a countryside school in Co Wexford and to dis-enrol her from the Dublin school she was listed to start in next September. (Resolution find a school, TICK!) My partner has already been working on a heritage project part-time there that he has to finish and maybe expand upon. This decision was the clincher of all our decisions. It had to be made quicksmart, so that the school could put in its book list order. That book list forced us to resolve to officially leave Dublin, right now, and it has given us a fixed base from which to now look for new work. We have a place to stay in Wexford, if temporarily, on my partner’s family farm, as luck would have it a beautiful old cottage otherwise empty and forlorn. We spent my maternity leave last year there and a lot of weekends since while my partner worked on his project. My parents are grappling with the idea that we’re moving further away from them at home in Galway. So here we are, reality lumping us to our own devices yet somehow at the same time cruising us along a not-quite-forgotten original plan. Not so harsh after all, huh? We’re almost relocated to Wexford now while we get our Dublin house ready for rental. 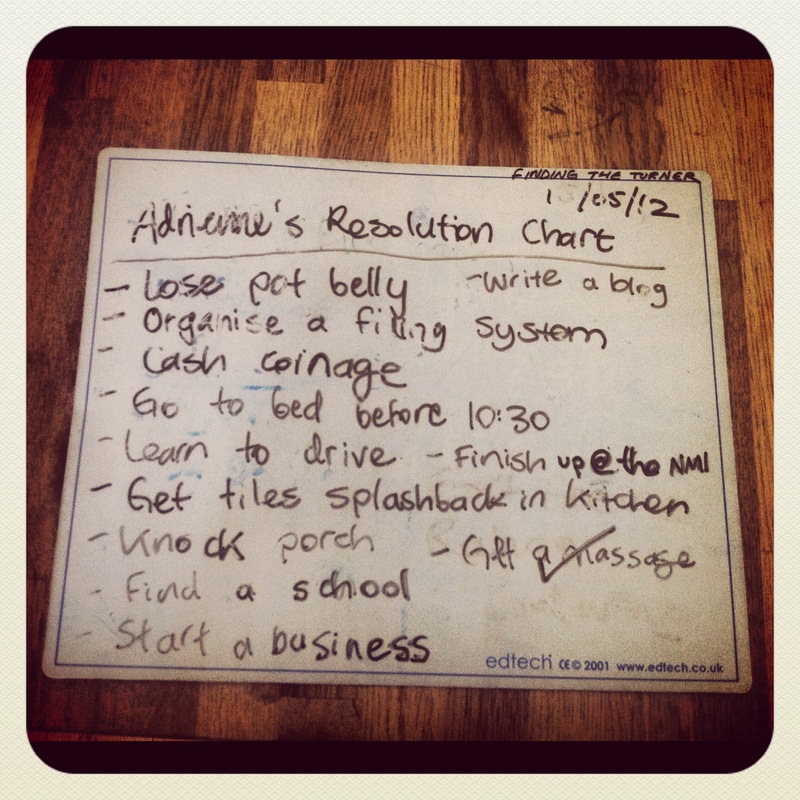 I’m keeping my eye on my resolutions chart and expanding on it. Turning “fear of the unknown” into “freedom of the unknown”. Inspirational and very honest! Love and respect to you Adrienne. I have no doubt you’ll pull through this and flip it into a period of very positive changes in your life. … Glad you thought it inspirational! From endings come new beginnings. What the caterpillar calls the end of the world the master calls a butterfly. I been through these sort of challenges myself, and good comes from it. Keep your focus something better will come along. I totally identify with this!!! I have loved archaeology since I was a child growing up in Graiguenamanagh. One side of my family were antiquarians and restored, lovingly, Duiske Abbey. I always wanted to study archaeology but my father thought it would be better if I was a secretary! I spent he latter part of my childhood in Dublin. When I move to the UK with my children, trying to escape an abusive partner I had the opportunity to study a degree in Archaeology but it still took me years to actually do it because, in my mind, I was not allowed!! But, lots of therapy later, and becoming a counsellor myself, I eventually got there.. I studied in Winchester University and I absolutely loved it. I worked as a volunteer with the Winchester Archaeology dept. My children were in their teens but I was a single parent now and all rested on my shoulders. This was what I loved to do and i was completely immersed in it. But then, at the end of my third year, I was studying part-time so that I could still mother my girls, my sister died suddenly and my daughter announced that she was leaving college! This meant that I was no longer funded by the Government to study anything! I was gutted! I had lost my only support in my family and lost the work I loved so much. Like you I had to apply for jobseekers.The man I spoke to was so nasty and uncaring. He told me in no uncertain terms that I had to stop studying my degree and get a job or they wouldn’t help me. I agonised over the decision to leave Uni, leaving it till the last minute and the Uni tried hard to get me to the last year so that i could get the diploma but I just had no money! I am now living in Egypt and would dearly love my own little farm. I had often looked at the deserted cottages and wanted to redo them as they were in the past but never had the money. I still hold onto that dream here where my husband and I want to build a small farm and love off the land in the old way. i hope to God I don’t have to let go of that dream too! I’m glad that things worked out OK in the end and you ended up on a farm surrounded by countryside. Wexford is beautiful and a lovely place to bring up your children. And you never know what life will bring you to. But keep on blogging. You have a lot of knowledge stored up inside you which I, for one, would love to hear! I’m glad my post struck a chord with you. Thanks too for the vote of confidence about the blog, it means a lot. I’m enjoying it but I’m very slow to write. I do most of it on my phone. A very honest and engaging account of a personal experience many of us can relate to. Still, it’s worth seeing this an opportunity to try new things, maybe learn new skills or explore new possibilities. Try to seek the positives and see this as a chance for personal growth. I’m sure things will work out in the end. Thanks so much Kelly M! I agree with you. Can totally relate to this, its incredibly tough having to start over. Since my work in archaeology has almost completely dried up I enrolled on a part-time HDip course, its very tough, but am seeing archaeology in a totally new light through the enthusiastic eyes of 12 year olds and the boredom and listlessness of Transition Years (the girls were mildly interested when I showed them jewellery) but have since learned powerpoints and lecture style dont work with this age group! its up to me to make it interesting. Good luck with your new pursuits. Im a Tuam native as well so might see ya for a cuppa sometime if you fancy sharing experiences. Thanks a million for sharing your story its nice to know Im not alone in feeling sorry for myself at the collapse of a career. Lets hope it will lead us onto new and fresh pastures. Really like the ‘re-combobulating’ word, I hope to use it in my Englsih classes on next teaching block! Hi Angela, thanks for the comment. Another Tuam native; I never knew! Definitely must meet up. I love that the transition year students and 12-year-olds are challenging you to engage them. Let them loose in it to find what interests themselves (eg the jewellery! That’s brilliant!) I think because archaeology is almost literally timeless, it’s endless. Something for everyone! Oh I felt very sorry for myself, that’s for sure but I knew I’d get out the other end, just didn’t expect it to take weeks instead of hours or days. Focussing on the new and different now, and working this blog helps! Best of luck to you too. PS isn’t recombobulating a great word?! A wonderfully honest and inspiring piece Adrienne. But know that all you’re hard work isn’t gone and wasn’t for nothing. Thank you for all the work you put into it over the eight years, our history is something to be treasured and watched over so thank you. I’m out of work too and hate being on benefit even though I too have paid for it with years of hard work but still, hopefully won’t be for much longer. Thanks for your comment! Your thanks are very kind also. I say go ahead and start your own blog and you’ll certainly be practising your own excellent advice. Go for it. I’m finding the best thing about writing this one is the clarity it gives me, myself. Doing it or my own therapy and am delighted at the lovely response it’s getting. Here’s to new adventures as you say! Well written Adrienne. Having been through this mill twice, you see life from a different perspective altogether. It is easy to become complacent in our lives as they inadvertently revolve around work only for it to all become so lost and confusing when it is gone. It should be seen a sa new step in life, a game changer. It is always good to make plans for our and our family’s futures but it is amazing how well we cope when those plans get suddenly changed or knocked off kilter. For you it is quite a drastic change having to move to a new county altogether but perhaps, like me, you will see the gift in redundancy. As sad as it is, it forces change upon us where we otherwise may never find the courage to do. Good luck on your new adventure. Embrace it and enjoy it and love every moment you get with your kids. I miss that time I had with my daughter but I definitely appreciate our time together more and it has brought us closer. I didn’t even know that was possible. Take care! “It should be seen as a new step in life, a game changer” – yes! This is so true. I was mostly ready to embrace that – I soon found I had to learn how though. I’m still figuring it out! It is a mill. To have it happen twice must be quite shocking. Meanwhile I have my list. I’ve been enormously slow to change tracks: it’s been almost 4 months now. That seems crazy. The time with my kids has been irreplaceable, that much is clear to me.